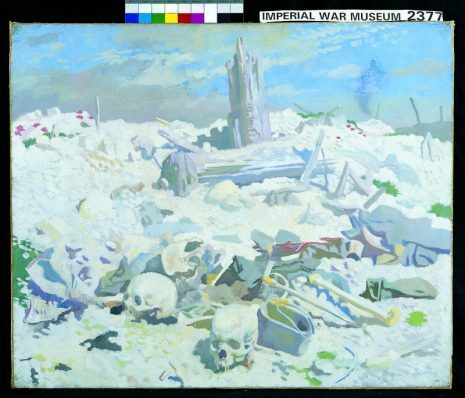 The battle of the Somme remains one of the most evocative names in British military history, its high casualty lists and seemingly minor gains leading it to become very closely linked with the wider debates regarding the nature of the First World War. It is of little surprise therefore that a high number of OAs also died, with 75 falling as a result of the battle, of whom 7 occurred on 1st July, the first day of the battle. Of these 75, 33 – that is to say nearly half – held the rank of Second Lieutenant, whilst only 7 served as privates. This can be seen as a reflection of British recruitment policy at the time, which was generally that positions in the officer classes would largely go hand in hand with having attended one of the great Victorian public schools, such as Westminster, Harrow or Dulwich. Another interesting observation about the OAs to fall is that 4 of them were under the age of 19, which was supposed to be the minimum age for British servicemen to be able to serve abroad; one, Private Wilfrid Tucker, was even 17, which meant that he was on paper too young to even be in the services at all. The issue of underage soldiers was a widespread one during the First World War, with as many as 250,000 young Britons across the four years of conflict serving at a younger age than they should have done. In a vast majority of cases however, this enlistment was voluntary, with many young men very much willing to join and fight despite being below the age at which they should have been allowed to join. © IWM (Q 1167). 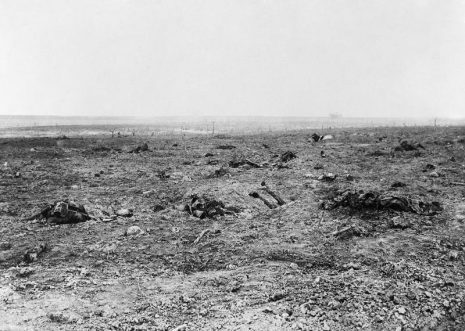 A view of the battlefield near Guillemont, September 1916. Originally taken for the Ministry of Information Collections by Lieutenant Ernest Brooks. The battle saw the deaths of the Styles brothers, Alfred & Arthur, who were not only the only set of OA brothers to be killed during the Somme, but also died just a week apart. Arthur, the younger brother, a Lieutenant in the Royal Welsh Fusiliers, was the first to be injured, being severely wounded at Mametz Wood on July 11th. He was invalided home to London but by then a tetanus infection set in, caused by having lain in the open unrecovered for several hours after being struck, and he passed away as a result on July 26th. In the intervening period, on the 19th, his older brother Alfred, a Lieutenant in the Cheshire Regiment, had also perished, killed by shrapnel as a result of a stray shell whilst resting in Trones Wood. A lifelong cat lover, Alfred was found with one asleep on his chest at the time of his death. The animal was unharmed and was subsequently taken on as a regimental mascot. The largest memorial for the Somme is that to commemorate the Missing at Thiepval, which honours 72,195 British and Commonwealth servicemen lost on the Somme, including 26 Old Alleynians. Designed by Sir Edward Lutyens, the Memorial was built between 1928 and 1932, ultimately being opened on August 1st of that year by the future Edward VIII. It takes the form of a massive arch, with a series of smaller arches making up each corner, for a total of 16 piers. One particularly interesting aspect of the Thiepval Memorial is that is specifically intended not to act as a cemetery, but instead to allow a memorial point for those whose bodies were either not recovered or not identified; this means that those originally commemorated on the Memorial whose bodies have subsequently been identifiably discovered and been given a marked grave have had their names removed from the Memorial. A good source for more information on Thiepval is The Memorial to the Missing of the Somme, by Gavin Stamp OA. Major Stewart Loudoun-Shand OA, serving with the Yorkshire Regiment, was awarded the VC for his conduct on the first day of the Somme, one of 9 allied soldiers so honoured that day. After being born in Ceylon (modern day Sri Lanka) in 1879, as one of ten children, and the second of five boys, born to a Scottish plantation owner, he attended the College from 1891 until 1897, in his final year serving as a member of both the 3rd XV and the 3rd XI cricket team. His four brothers all attended the College as well, with two of his younger brothers also going on to attain notable military careers, Alexander as head of the Royal Australian Naval College and Eric as a recipient of the Military Cross. After leaving school he volunteered for the Army to fight in the Boer War, during which he served as a Lance-Corporal in the Pembrokeshire Yeomanry, before returning to Ceylon to involve himself in the tea business. Upon the outbreak of War in 1914 he returned to England and once more joined the Army, this time as a Lieutenant in the Yorkshire Regiment; by the time of the Somme he had worked his way through the ranks to that of Major. According to the official citation his VC was awarded ‘for most conspicuous bravery. When his company attempted to climb over the parapet to attack the enemy’s trenches, they were met by very fierce machine gun fire, which temporarily stopped their progress. Major Loudoun-Shand immediately leapt on the parapet, helped the men over it and encouraged them in every way until he fell mortally wounded. Even then he insisted on being propped up in the trench, and went on encouraging the non-commissioned officers and men until he died.’ Loudoun-Shand was 36 at the time of his death, and was buried at Norfolk Cemetery in the town of Becourdel-Becourt.